Recently, students from Invention Factory, The Cooper Union’s Invention Accelerator, brought their inventions to a wider audience in a variety of ways. Student teams appeared on television shows and in publications, applied to invention competitions, and won admission to the University Innovation Fellows program (associated with Stanford's "d.school"). They used these platforms, as well as the presentation skills learned in the 6-week summer program, to garner more exposure for their inventions as well as to seek funding for further development. Giovanni Sanchez and Ruchi Patel appeared on the December 1 episode of “Make Me a Millionaire Inventor,” a CNBC reality show that highlights promising new inventions while matching inventors with potential investors. 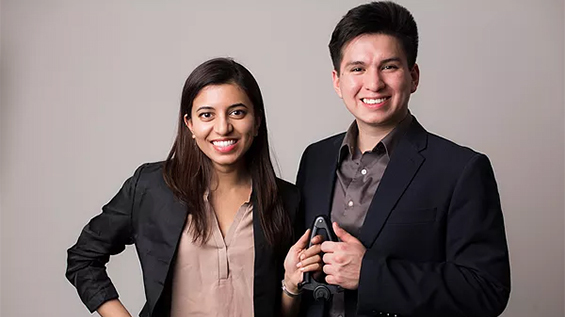 Giovanni and Ruchi, currently juniors at the Albert Nerken School of Engineering, presented SutureSelf, a rapid wound-closing device that operates like a medical stapler, but uses traditional suture thread instead of metal staples. Their device reduces the likelihood of infection, torn skin at suture sites and a host of other problems. SutureSelf won first place ($5,000) in Invention Factory in the summer of 2015. The team considered appearing on national television to be fantastic publicity, but it also gave them a tangible advantage: the show hired an engineering firm to help perfect the invention at no cost to the students. “The show gave us a big jump start on our product design,” Giovanni said. Their current prototype is operational on an oversized scale, but they are currently working to shrink the device to fit into a case sized for use in an operating room. They have applied for a full U.S. utility patent and created a company, Spario, to promote their suturing device, renamed "QuickStitch." Ruchi adds that “we are applying for VentureWell E-teams, and applied for the Y Combinator for the Summer 2017 session.” Giovanni and Ruchi were both awarded membership into the University Innovation Fellows program, a network of students dedicated to improving higher education through entrepreneurship. In the summer of 2015, Mary Dwyer was a rising freshman (she was released from her last weeks of high school to participate in Invention Factory). She teamed up with Anushree Sreedhar, a rising sophomore in chemical engineering, to win second place ($3,000) for their SEAL Fire Extinguishing Ball. The device is designed to slow or stop all types of small fires quickly and safely, while also being intuitive to use and attractive enough to be placed in plain sight. The extinguisher has the form of a double-chambered ball that when twisted, releases a forceful stream of vinegar mixed with baking soda through the top of the ball. 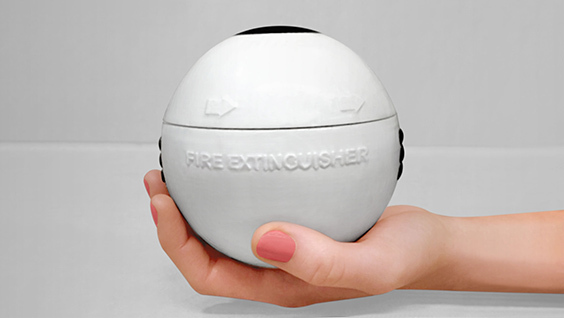 The ball can be pointed at a fire or thrown directly into a fire, extinguishing it. The two were finalists in the 2015 Lemelson-MIT Undergraduate “Use it!” competition and thus attended EurekaFest 2016, a multi-day celebration to encourage young inventors. 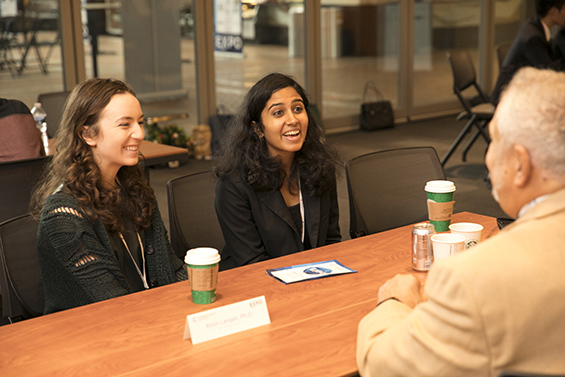 Mary and Anushree entered SEAL in the Collegiate Inventors Competition, and placed as one of five teams of undergraduate finalists from around the country. They traveled to the United States Patent and Trademark Office (USPTO) in Alexandria, VA to showcase their work and meet the judges of the competition, all of whom were inventors who have been inducted into the National Inventors Hall of Fame. Although the team did not win the competition, they were both thrilled to be part of such a high-profile event so early in their college careers. 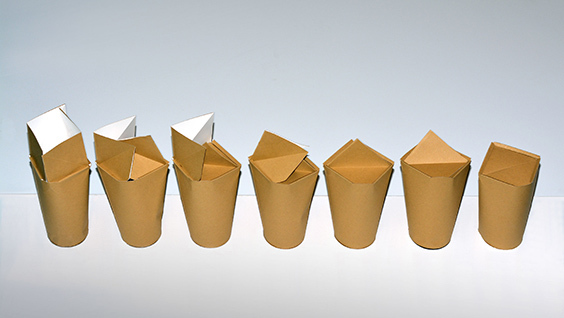 Tom Chan and Ben Ma, both juniors in mechanical engineering, tied for second place with Anushree and Mary in the Invention Factory 2015 session for their Spill-Resistant Disposable Cup which is on display at Origami Universe in Chimei Museum, Taiwan until May 2017. Their work was featured in dotNYC, a weekly webcast about New York City's tech community, and they have applied for a Japanese Patent as well as Fast Company's World Changing Ideas Awards. Like Giovanni and Ruchi, they are applying for an MIT-Lemelson Award as well as a VentureWell E-team grant. Invention Factory alumni from the summer of 2016 are also busy developing their products: Zach Tzavelis ME '19 and Casey He BSE '19 were both rising sophomores when they invented GutterValve, an apparatus for automating the cleaning of gutters. Like Giovanni and Ruchi, Zach is a University Innovation Fellow. Zach and Casey have been attending conferences and design workshops to improve their designs. Last summer’s first-place winners, Dongho Kim and John Yoon were rising sophomores studying mechanical engineering when they developed the Tremor Spoon, a spoon designed to make eating easier for patients with Essential Tremor or Parkinson’s Disease. They too applied to the MIT-Lemelson competition and have made it passed the first cut, and are waiting to hear if they will be finalists. Their invention was covered by the Daily News. They are applying for a full United States patent thanks to pro bono work offered by patent attorney Ron Slusky, who has been a judge for Invention Factory competitions. Professors Alan Wolf and Eric Lima, founders of Invention Factory, have encouraged the student inventors to pursue funding sources and publicity for their inventions, each of which is protected (for one year) by a provisional patent application, written by the students themselves, under Professor Wolf's guidance (Wolf, Chairman of Physics, is also a patent attorney). 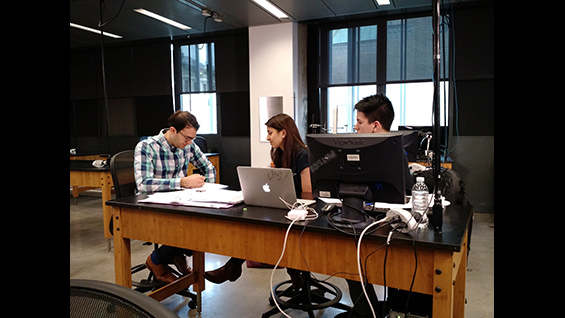 Professors Lima and Wolf work year-round with student teams that choose to continue developing their invention after the end of the Invention Factory summer program. The pair notes that "invention is just the start of a long road towards bringing a product to market, but our students have created some incredible inventions that we believe are definitely market-worthy."